As the boat nears the shallow sandy shore my hands unclench and my shoulders relax. For the past forty minutes I’ve been watching every wave and how noticing how perilously close to the top of our shallow boat the water is. We have no life jackets. Ever practical, R has a plan ready for if we capsize – we all need to hold onto a towel so the three of us don’t get separated which increases our chance of rescue. The past few hours have been worthy of the most poetic description of any travel brochure for idyllic desert islands; snorkeling through glittering shoals of fish over expansive coral in warm, crystal clear waters with a picnic lunch on an empty white sand beach in the bay of one of the Daymaniyat islands. The rumoured tropical storm looked unlikely then, but all too real and threatening now. Refuelling in open water from a can plus the captain’s continually moving of people’s position in the boat to balance it are not reassuring. Most of the party seem oblivious. So what brings us to this perilous situation? Two friends and I have joined a weekend trip away with a group from Dubai organised via the ‘Meet Up’ app, lured by the mountain ranges and broad coastline of Oman over a long weekend. It takes us about five hours to drive from Dubai to Al Sawadi Beach resort including the border crossing. We’re up super early for breakfast the next day as instructed by our group leader. Too bad the boat driver isn’t and the delay in setting off coupled with the inadequate size and power of the vessel has pushed us into the imminent bad weather. Thankfully we do eventually reach dry land unscathed, nails bitten to the quick. Our next destination is Al Hamra up in the Hajar mountains, about two and half hours drive away, and we are eager to get there especially because of the storm. Indecision from the leader of the group means we set off late and into the maelstrom. Eight hours later, through torrents of water from the sky and burst rivers we’ve had to ford, we finally arrive – exhausted. We pass a car washed away in a river unaware that the deluge we’ve braved has swept at least six to their deaths. R is spent, having kept her nerve behind the wheel throughout the whole demanding journey. The water heater has not been switched on in our room so we crawl into our beds coated in sea salt and sand. Next day, my companions slumber while my internal dog-walking alarm clock rouses me just after 6am. I creep out to gaze at the misty valleys below me from my mountain top, to the soundtrack of birds. I wander to higher ground and meet some other members of the group. The drivers for our next journey seem to have the same alarm clock as the boat owner so we wander around watching the sun come up, our perils of the previous day fading like the mist. A group of local guys who are brewing tea in a kettle on a fire offer to share some with us. It’s milky and infused with wild za’atar and ‘spice’ which we can’t find a common word for. It’s similar to karak chai but less sweet and, with the slightly medicinal flavour of the herbs, refreshing and addictive. An hour later, with the sun streaming down into the valley our driver Zaher is navigating the rough road winding down at the edge of a precipitous drop. Although usually a nervous passenger, I feel so safe with his confident careful approach to the journey and we chat in pidgin English about his day job in Muscat and family here in the rural village. R is a geographer and explains how the rocks were formed, the striations and colours so clear and dramatic, literally showing the creation of the world. The swathes of rough green schist are particularly eye-catching. At the bottom of the path, three small boys are making the most of the recent rainfall taking turns to slide down a brilliant natural smooth helter skelter, running and giggling. 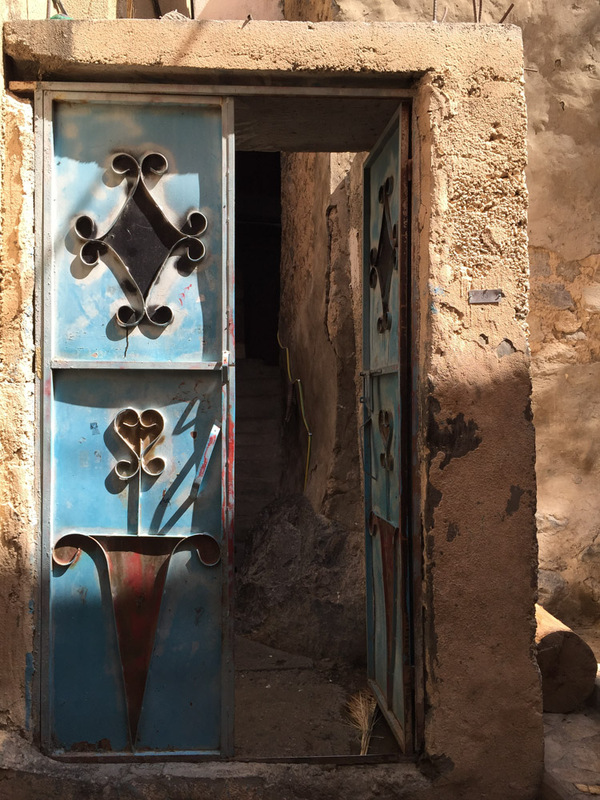 It emphasises the simplicity of life that still hangs on a knife-edge in Oman. This guy didn’t get his feet wet! Four of us decide to walk to the village. It looks as though the path leads to a mountain side but as we get nearer to a small oasis of palm trees the fissure through the rock is clear and we wind our way through, feeling dwarfed by the towering sides and cool depths. There is water to negotiate, unsurprising after last night storms and one deep puddle that we cannot find a way round so our feet get a dunking. After a while we are aware of a shadow following a little behind. A young local boy is taking the same path but stays at a distance. Finally he sits comfortably at the top of a rock, the perfect quiet spot to contemplate his mobile phone undisturbed, his dishdasha completely immaculate. His local knowledge has guided him better than us; his feet are dry. 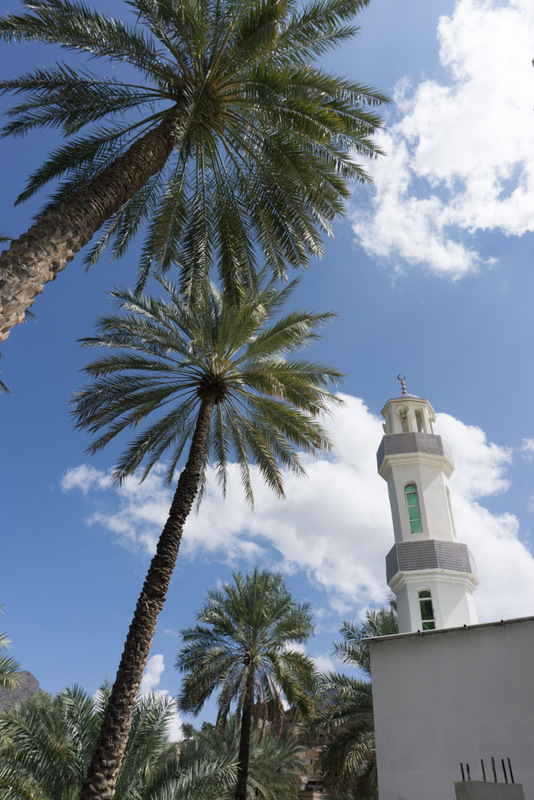 The village of Balid Sayt is enclosed by mountains with fields and palm trees at its centre. There must be a way in by road but it’s not obvious. Everything is shimmeringly tranquil. Negotiating the narrow back streets, darkly shielded from the beating rays, some little girls see us, giggle and run inside. The whole place looks deserted under the mid-day sun from the vantage point of the old fort. We meet up with other members of our group under an ancient ghaf tree in the centre of the village. It’s a much better place for people watching and to escape the sun. Open backed trucks drive up and villagers lop off the odd branch or twigs for feeding to animals. We all decline the option of walking straight back up the mountain that was on our itinerary for early morning. All of us except one. C heads off at pace with the guide, who has already been up this vertical ascent once today. “See you at the top” we say, in admiration, with no regrets for taking the easy option back to base by road. The path from our hotel across the top of the mountain is waymarked on the flat, fissured stones which are like beautiful paving slabs. The views are mesmerizing and vertiginous. R and I get into some meaty topics with new friend A, adding extra energy to our walk. Large rain drops dot the cream coloured rock but it comes to nothing, however we can see lightning storms flashing in the distance. A small wooden sign appears to point down a sheer drop to a village. You’d have to be barking mad to contemplate it. Would C appear? Then suddenly she does, striding across the plateau, hardly breaking a sweat after a two-hour hike straight up. She receives a hero’s welcome. We are tempted by our guides’ offers to go somewhere licensed for the evening (Oman is not dry but alcohol is usually only available in 5 star hotels), but not tempted enough for an hour’s drive. On the next day, our drivers are bang on time. They are professional men who have good jobs in the city during the week; they’ve been friendly and genuinely welcoming. Back down the winding route into the valley and beyond into even more dramatic and slightly foreboding rocky scenery, we finally meet up with our canyoning leaders at the start of Snake Gorge. They are trained professionals in outdoor pursuits and the tone, leadership and organisation goes up a notch or two (or a hundred). We don helmets and buoyancy vests, our footwear is double checked, we are given safety instructions and warnings. 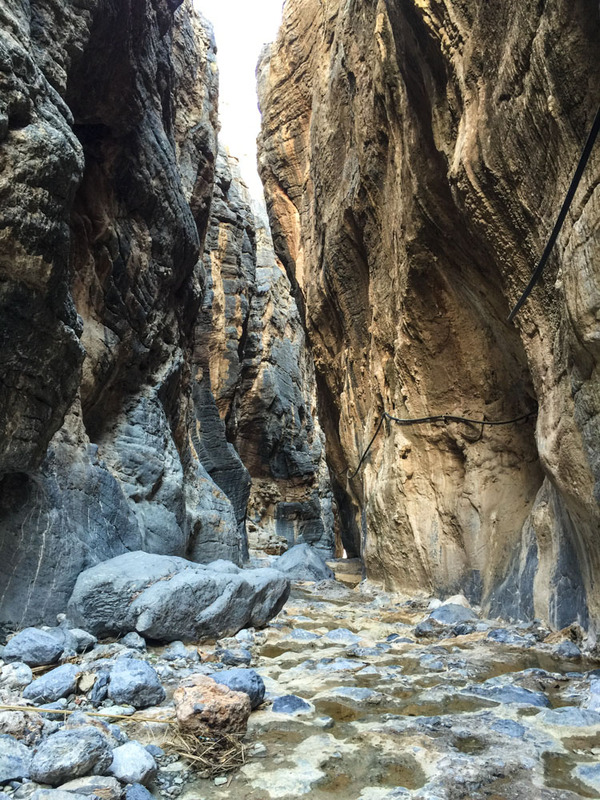 It’s not alarmist – people enter these canyons unprepared and have lost their lives. Cheap waterproof camera. Images not taken on a GoPro! In Snake Canyon – with the snakes! Inside Snake Canyon. Mysterious, beautiful – and yes the water was warm! For the next couple of hours we are guided down smooth rocky slides, clamber from one canyon to another, swim through pools – some in caves – and even see a couple of small, elegant snakes that give the canyon its name. They are constrictors too small to be of danger to anything but very small mammals. The whole group leap off a rocky promontory into a deep pool below one by one; most with a degree of trepidation, especially me. I freeze with fear, blub uncontrollably then give silent assent to be pushed off. Apart from this blip, the whole hike is otherworldly, beautiful and exhilarating. Zaher meets us at the end with a home-cooked lunch and we sit under the palm trees sharing chicken and rice mansaf cooked by his mother and sisters. It’s one of the most deliciously simple meals ever. Chatting over lunch is a better way to get to know some of our group – breaking bread together. Earlier, under duress, and inexperienced leadership, mostly we haven’t bonded which is is shame; perhaps under different circumstances…. We drive back by a different, faster and less populated route, the mountains flanking our right hand side most of the way. The border crossing takes a while but we zig zag back through leafy Al Ain and in no time the high-rise of Dubai’s skyline appears. Our Omani drivers Whatsapp emojis, friend us on Facebook and entreat us “When are you coming again?”, eager to show us more of their fascinating land. When indeed? For the Daymaniyat Islands we stayed at the Al Sawadi Beach Resort which is now permanently closed. Hoping it will reopen sometime soon. Not luxurious but a great location plus there is a limited area for camping. Shorfet Al-Alamin Hotel – remote location, great views, comfortable rooms, terrible showers! Our snake canyon trip was arranged via the Muscat Diving and Adventure Centre and the ex-military guys who led us were brilliant. Another company to check is Absolute Adventure. 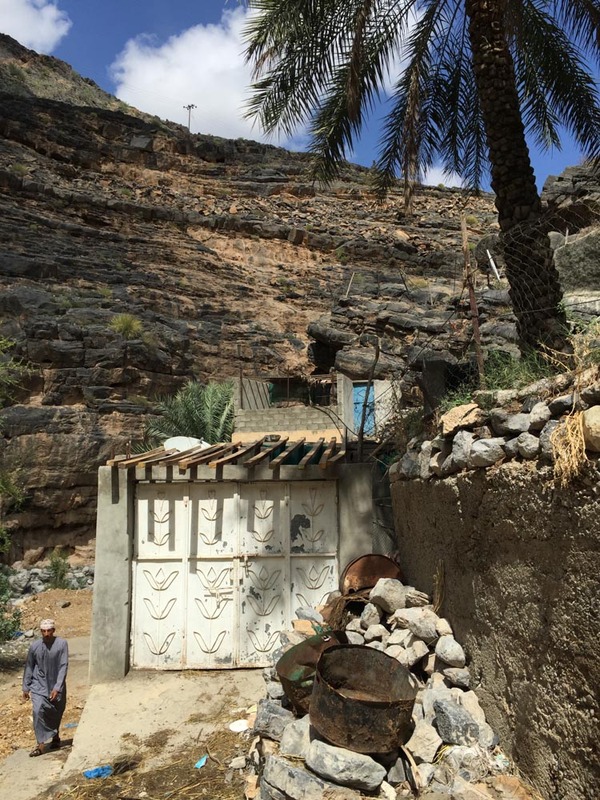 Gulf for Good has charity challenges in the region (and beyond) and at time of writing there is one in the Mussandam, Oman during December 2016. And if you want a local driver and guide in that area of Oman email me or comment below for Zahed’s contact details. Check the weather forecast. Even the sunniest day can bely extreme conditions on the way. Make sure that you check the credentials of your trip leader, especially if doing any extreme or challenging activities. If in any doubt use professionals to arrange and guide your trip. Use a robust four-wheel drive vehicle and ensure the driver has experience in off-roading. Morning cuppa – not bad eh? I’d love to hear about your adventures. What have you done that took you to a place out of your comfort zone or took your breath away? Superbes photos et récit of Your amazing Journey ! Love seeing great places near Dubai. Did you do this trip recently? Not too hot? So well written, I felt like i was there with you! Wow – now that is an adventure! You are really quite brave, Sally! It’s very rugged and wild. I might have driven the hour for the drink! A beautiful adventure and what stunning landscapes! What a stunning looking place! I don’t know why but such exotic places so far away so that they’re almost unattainable, but they’re really not, are they. I’d love to visit there one day. Thank you for taking me there with your words and photos. Meetup’s just fab, isn’t it? So many opportunities to meet interesting people to share wonderful experiences such as this. Not sure if my heart would be able to stand the original boat trip though! The chicken mansaf sounds fab! 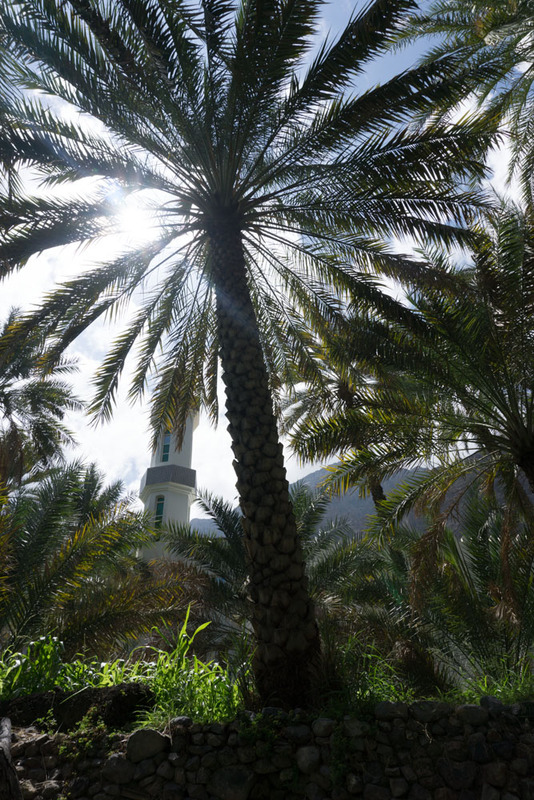 Such a magical Country Oman is.. and you capture that honestly and very well Sally!! Those pictures are beautiful.